Can You Make Chicken Soup With Legs & Thighs? Frugal home cooks know that nearly every part of a chicken tossed into a pot makes good soup. However, for hearty, flavorful soups, legs and thighs are ideal because they have a stronger taste than white meat and make a correspondingly richer broth. Don't just save chicken soup for days when you're feeling under the weather. Seasonings and varied ingredients completely change the flavor profile, making it a good choice for regular inclusion in a healthy diet, particularly when you're careful about the sodium content. Chicken legs and thighs are often sold attached as quarters with the skin still on. Quarters tend to be less expensive than pre-cut pieces and don't need separating before adding to a soup pot, although cutting the chicken into smaller pieces will allow for faster cooking. Do remove the skin first to keep the fat content down. 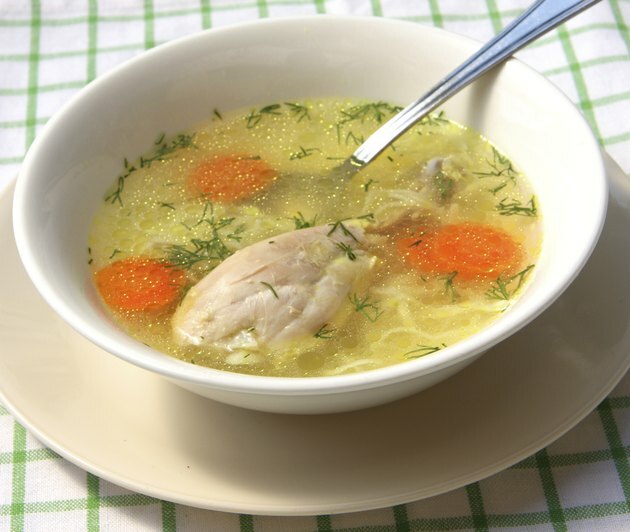 Traditional vegetables for chicken soup include carrots, celery and onions, but branching out adds more flavor and extra nutrients. Leeks, peas, sweet potatoes, chili peppers and parsnips all work well. For easy chicken soup, add your skinless chicken to a soup pot with vegetables, seasonings and enough water to completely cover the contents. Let it simmer for an hour or two and remove the chicken when cooking is done. Skim away any foam or fat that has accumulated, then shred the meat from the bones and add back into the pot. For the easiest and fastest chicken soup possible, cook vegetables in chicken broth and add the meat from pre-cooked legs and thighs. Dark-meat chicken is a little fattier than white meat, with 13 grams of fat and 290 calories in each 3-ounce serving, but it's also a good source of protein, at 39 grams per serving. Legs and thighs contain 11 percent of the iron you need every day, and 132 milligrams of sodium, so prepare your soup with water or low-sodium broth. Researchers at the University of Nebraska Medical Center found that chicken soup really does contain substances that can help with upper respiratory infections which cause the common cold. They don't know exactly why but theorize that it's the combination of ingredients, so don't leave out the vegetables. Sweet potatoes and carrots are a good source of vitamin A, while bell peppers contain vitamin C.
Using boneless, skinless chunks of legs and thighs cuts down the cooking time considerably, but use homemade or low-sodium commercial chicken stock to keep the flavor from being too thin. Pre-cooked pasta, rice or dumplings added to soup after it's cooked keep the broth clearer, but all are suitable for cooking with the soup. Change the flavor profile of your soup by using fresh herbs, curry spices, chili powder, lemon juice or vinegar.